To receive the maximum benefits from your jump rope training sessions, you'll want to follow the four steps of my jump rope system (preparation, intermediate, conditioning, and sports training phases) for safe progression. This will be especially important when we reach the high-intensity jump rope training programs for developing superior fitness and increasing competitive advantages in time and space that I will discuss in future articles. 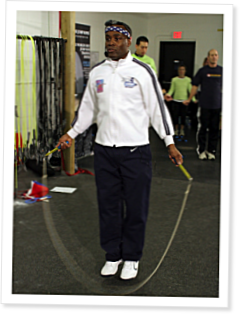 Once you have completed the first part of the preparation phase, explained in my October 2007 article (which teaches proficiency with proper jump rope form and the two basic jumping techniques, and discusses equipment, environment, and safety), you will enter into the second part of the preparation phase. During this period, the goal is to build from your established jump rope proficiency of 140 to 500 consecutive jumps in safe increments. Building jump rope endurance to 500 jumps Remember, jumping is a skilled movement that requires proper timing and coordination of the rope swing to complete each jump. During the second half of the preparation phase, we will work up to 500 jumps in order to develop a basic jump rope capacity. In the beginning, it is best to strive for a set number of jumps instead of time because it will help you to gradually increase your jump rope endurance and coordination while keeping you challenged and motivated every step of the way.